Elizabeth Wyman | The Journal Gazette A’laya Chapman, who scored 14 for the Archers, drives to the basket Tuesday night. Elizabeth Wyman | The Journal Gazette Lamiya Woodson looks shoot around two Huntington North players in South Side's sectional win over Huntington North Tuesday night. The South Side girls have no issues starting games. It's the second half of games that have been their kryptonite. 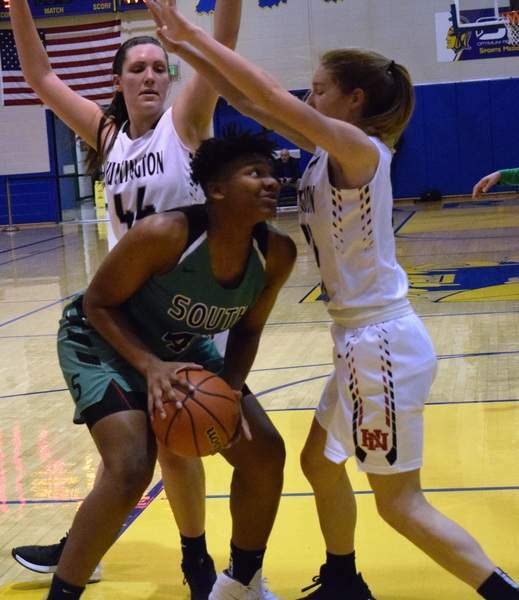 But with a strong defensive effort and the offense to match – a 42-point second half – South Side defeated Huntington North 65-35 in the first round of the Class 4A Homestead Sectional on Tuesday night. The Archers (16-7, 7-2 SAC) got to the basket with ease against a Huntington North (7-16, 4-4 NE8) team they beat by 49 a week ago. A'laya Chapman used a spin move and finished at the rim to end the first quarter and give South Side an eight-point lead. A 7-2 Huntington North run spearheaded by Madalyn Robrock pulled the Vikings within a point, at 16-15, with 2:07 left in the half. “I think they came out hungry and very aggressive,” Chapman said. After a frustrated Goodwell called a timeout, her team rattled off a 7-0 run to end the half up 23-15. “They made a little run, so to be able to keep our head and composure and finish strong in that quarter was really helpful to lead us into halftime and come out with our original starters,” Goodwell said. South Side'sleading scorer, freshmen Olivia Smith, didn't start or play the first half, throwing the rotation for a loop. “Trying to maintain that kind of intensity was really a struggle for us, people were out of position,” Goodwell said. Smith scored 11 points in the second half. The second half woes were nonexistent for the Archers this time. After a tough Jaci Jones offensive rebound, the guard took it the length of the floor, executing a swift Euro-step to push the South Side lead to 37-21 with 3:50 to play in the third quarter. 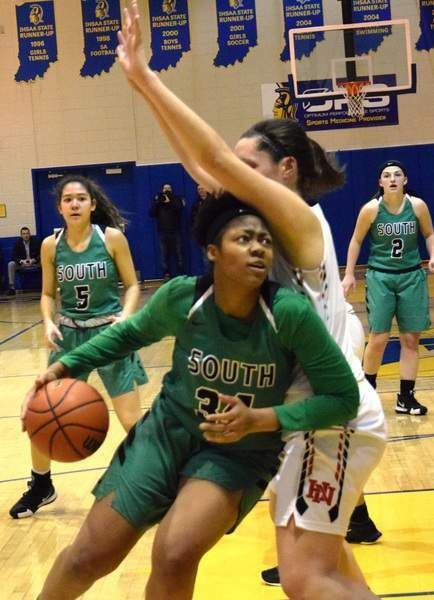 The Archers could all but stamp their ticket to a matchup with Muncie Central on Friday after T'laizha Morris reeled in her own teammate's missed free throw, chucked the ball in the air anddrew a foul as it fell through the basket to give the team a 50-21 lead late in the third. The Archers looked nothing like the team that fell 65-51 to Carroll earlier in January. “We just lacked motivation. I think that the record of Carroll, them being on a four-game losing streak and the mindset going in thinking that we were just better showing up,” Goodwell said of that loss. “To be able to bounce off that loss is really big for us. Many are anticipating South Side to meet Homesteadfor the sectional championship on Saturday. The Spartans have won both previous matchups. “I think what they (players) keep forgetting is that we were in both games and just allowed the second half to get away from us in both games,” Goodwell said. Robrock led the Vikings with 16 points and Chapman finished with 14 for South Side.